The back linings and back braces are done. The photo shows that there are just two back braces. I will be using just two back braces, but its the back brace near the slipper foot that is to be removed, not the middle one. This is remedied now. Lots of head scratching to do on this guitar! 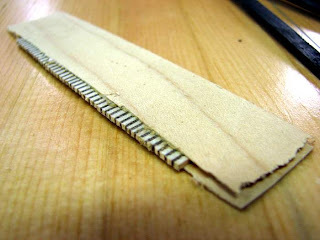 I have decided that, before I close up the back on the FE17-ish guitar, that I need to have the bridge and the fingerboard made. This is because of the Tornavoz. You can see it sitting in place and you can see how it will interfer with clamping the bridge on later. Well, I can. 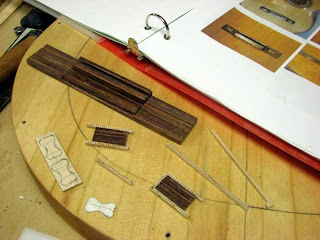 I have decided that, before I close up the back on the FE17ish guitar, that I need to have the bridge and the fingerboard made. 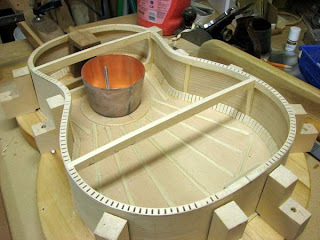 I may choose to glue on the bridge before installing the tornavoz and closing the back. 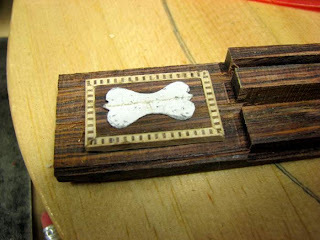 I had a scrap of Brazilian Rosewood that I bought in an offcut table at a local lumber vendor, but it was not the right dimension for a bridge so I had to re-cut it and glue it up the way that I could get a bridge blank out of. So, after I cut the basic shapes out I find myself wondering how hard it would be to do it like the original? You can see it in the lower left photo of my notes, note the decorated wings. So I'm thinking I have some laminate leftover from making my herringbone that I could use for the little borders-just sandwich it between some veneer, border an offcut of the bridge, and inlay it in the wings. Here is is just sitting on top of the rough cut bridge wing. The original had a lozenge shaped pearl inlay in the center. Here is my paper pattern sitting in place. I don't have any pearl, so I'm thinking that I will use some figured maple instead, and the colours will blend in nicely, too.